As one of the four key drivers of consumer conversation performance, sentiment is a powerful marketing lever for brands to pull. But a common myth is that when a brand is frequently “liked” by fans online, this positivity extends to real life conversations too. Likewise, if haters dis brands in online consumer reviews, they’ll complain to friends offline too. As it turns out, this couldn’t be further from the truth, as Engagement Labs proved this summer in an extensive study of consumer conversations. In comparing the performance of 500 U.S. brands in both real life and social media conversations, we looked closely at net sentiment – the percent of sentiment that is positive minus the percent negative. We expected to find a strong relationship between brand performance online and offline, but the data proved otherwise. The relationship between offline and online conversation for sentiment is close to negligible, reinforcing the need for brands to invest in strategies that drive positive sentiment in both spheres. 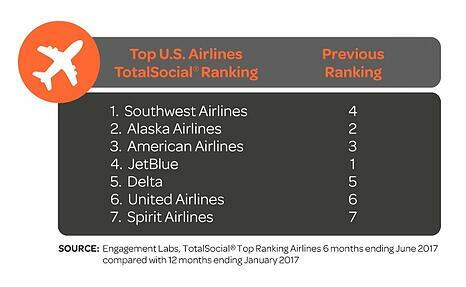 One brand that has succeeded in both online and offline conversations is Southwest Airlines, which soared to first place from fourth in our second annual TotalSocial® ranking of U.S. airlines – a measure of brand performance in driving consumer conversations both in real life and social media. Southwest Airlines increased its TotalSocial performance by 8% because consumers are talking positively about the brand in both offline and online conversations. What does it take for marketers to achieve the same result? Here are four tips for driving positive sentiment. Brands that focus solely on social media performance are missing a big chunk of the marketing picture. Why? Real-life conversations drive twice the sales as conversations in social media. Ignoring these real-world conversations is a huge missed opportunity for brands. Further, if the conversations consumers are having offline turn negative, it presents a significant brand risk. Furthermore, if marketers aren’t listening to conversations in both spheres, they’re likely to miss brewing issues and important signals that indicate it’s time to shift strategies. Southwest’s approach to delivering a stellar brand experience offers valuable insights for marketers seeking to drive positive sentiment. As a whole, the airline industry has experienced more negative conversation than most industries. But Southwest has managed to flip the script by focusing on strategies that motivate consumers to talk positively about the brand. Its commitment to transparent fare pricing and exceptionally friendly service are just two of the ways they exceed expectations, leading to brand advocacy. Another thing Southwest does exceptionally well is to focus on its two most important audiences – customers and employees. Stories abound of the airline’s employees going the extra mile to assist customers, such as personally delivering lost luggage containing life-saving medication to a passenger’s home. This kind of dedication doesn’t happen by accident. Southwest is deliberate in hiring employees who are engaged with and embody the airline’s brand values, writes Julie Weber, Vice President of People, in Harvard Business Review. United Airlines has been in the crosshairs of negative conversation several times over the last year. As a result, its offline sentiment scores fell 29% in our latest ranking, while its online sentiment dropped 21%. To recover, United Airlines will have to invest in a strategy that generates more meaningful and positive consumer conversations in both spheres. In the meantime, however, both Southwest and JetBlue have taken steps to avoid similar outcomes. After the media and consumers expressed outrage over United Airlines’ ouster of a passenger on an overbooked flight, Southwest announced they would no longer follow this industry practice. Likewise, as passengers sought to evacuate Florida ahead of Hurricane Irma, JetBlue was the first airline to cap its fares at $99 after consumers accused its competitors of price-gouging. Although marketers may often feel like they have little influence over consumer sentiment, these examples prove otherwise. The key is to listen to what consumers are saying both in real life and in social media and to develop strategies that spark positive talk about your brand in both spheres. To learn more about how to create more positive consumer sentiment for your brand, download our complimentary new e-book, 5 Myths About Social Influence Online and in Real Life...and 5 Realities.